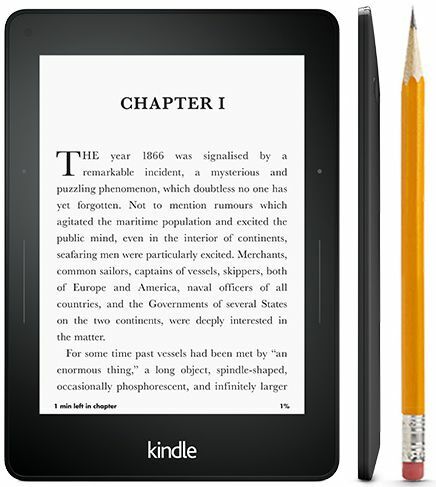 With the success of the Kindle Paperwhite, Amazon is adding a new high-resolution model to it’s family of e-ink readers. The Kindle Voyage sits at the top of the Kindle hierarchy and is equipped with a high-resolution, front-lit display, a touchscreen, and touch sensors. Like the Paperwhite, the Voyage’s 6 inch, 300 ppi display is also front-lit. The new tablet is also equipped with 4GB of built-in storage, supports 802.11n WiFi. The Kindle Voyage also has an adaptive light sensor to help adjust it’s brighter front light. Amazon has the Voyage up on it’s front page at $199 for the WiFi version and $269 for 3G version.